LCA’s customer care department receives many calls about a wide range of topics: billing questions, water quality problems, questions about low pressure, a high water bill, and many more. However, a high percentage of customers’ questions about LCA’s water service are related to interior plumbing. Customers are responsible for resolving interior plumbing issues, as well as maintaining the customer portion of the water or sewer service line that runs from the street into the house. 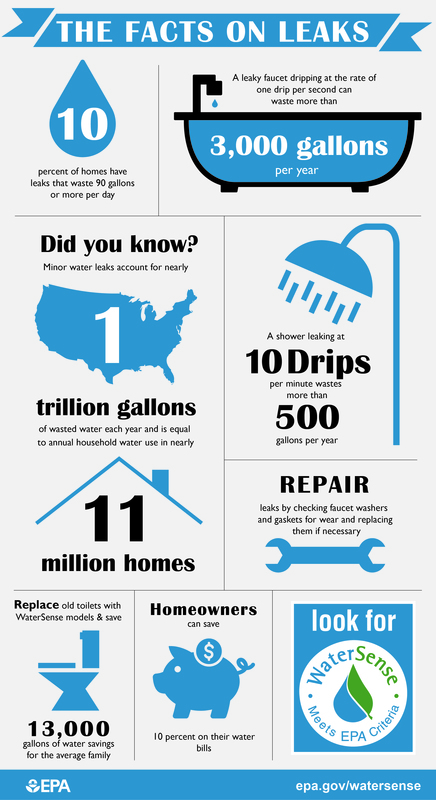 Check out this Infographic to understand how leaks can add up! Here’s a video with tips from the U.S. Environmental Protection Administration WaterSense program to help you find and fix leaks in your home. Use this handy Detect and Chase Down Leaks Checklist to help. Most often, unless we are experiencing a water main break in your area, low pressure problems are caused by issues inside your home such as a clogged faucet aerator or a malfunctioning pressure reducing valve. Even if you are completely out of water, the issue is often a result of a problem inside your home, such as a frozen pipe during winter or a valve turned off that affects your water supply. To learn more, download our LCA Guide-Low Pressure . If you have a high water / sewer bill, and the bill indicates the meter reading is an “Actual” reading, that means the volume of water you were billed for was accurately measured by your water meter. LCA has no way of investigating where the water goes after it passes through your water meter. In our troubleshooting guide, we provide some helpful hints and tips for how to find leaks or determine if that high volume of water is still flowing through your meter. To learn more, download our High Water Bill Troubleshooting Guide. If you have a sewer backup and LCA is your sewer service provider, we can help, but we are not responsible for unclogging customer service lines or interior plumbing. You can check your sewer cleanout box to see if wastewater is flowing normally. If so, the backup is an interior issue and you’ll need to call a plumber. You should also be sure to remove trees to avoid tree root growth over your service line, and avoid flushing larger items such as diapers, food, sanitary napkins, grease, etc. If you are noticing a buildup of white scale on your faucets, or on your dishes after the dishwasher runs, this is caused by water hardness – calcium and other minerals that are naturally present in our water supply. Some customers also notice white particles in ice cubes or a white film on pots after boiling water. LCA does not treat the water to remove these minerals as they are essential for human health, and the choice to remove calcium from your water is a personal decision for each customer. If you are experiencing a lot of issues with water hardness and white deposits, you should speak with a plumber about your options for installing a water softener. Still having a problem? No problem! You are always welcome to Contact Us to discuss any service issues you are experiencing, or use the Report a Problem form to submit your information. LCA’s customer care team is here to help!